The Oscar race is on with most of the potential contenders being released in the next few weeks. 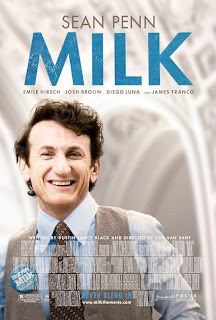 Gus Van Sant's portrait of gay activist and political martyr Harvey Milk is sure to scoop up its share of nominations. First and foremost would have to be Sean Penn's terrifically subtle and sensitive portrayal of the title character. Vocalization, mannerisms, facial expressions--all the small details add up to a performance where Penn's natural charisma is focused and channeled in such a way that he doesn't just play the role, but inhabits it. James Franco is deliciously adorable as Milk's partner, Scott Smith and Emile Hirsch plays an impishly mischievous Cleve Jones. Everyone in the cast is top-notch and their ability to convey the sense of the times and place historically is matched by the great production design of Bill Groom and costumes by Danny Glicker. Through the talents of Groom and Glicker (along with set decoration by Barbara Munch) combined with archival footage, we are transported back to the 70s where times seem completely alien and yet not so different from today. Back then it was Prop. 6--today it's Prop. 8. But while the numbers have changed, the basic issue of gay rights--human rights--is the torch that Harvey Milk carried. The movie provides a solid history lesson--to those of us already seeming condemned to repeat it. Unfortunately, that may be its biggest flaw. For in trying to accurately convey the events leading up to Milk's election to San Francisco city supervisor, the script by Dustin Lance Black gives short shrift to the intriguing characters, personalities and relationships which fueled the movement. Although much detail went into illuminating Harvey Milk's life (or at least the last eight years of it...)--from the recreation of the Castro Camera Shop which was the birthplace of his activism to the real-life Danny Nicoletta and Cleve Jones acting as consultants for the film, many of the supporting characters ended up being drawn in broad, impressionistic strokes. Still, it's a good film and an important film--one that measures not only how far we've come, but how far we still have to go as well. Desperate Housewives - What More Do I Need?